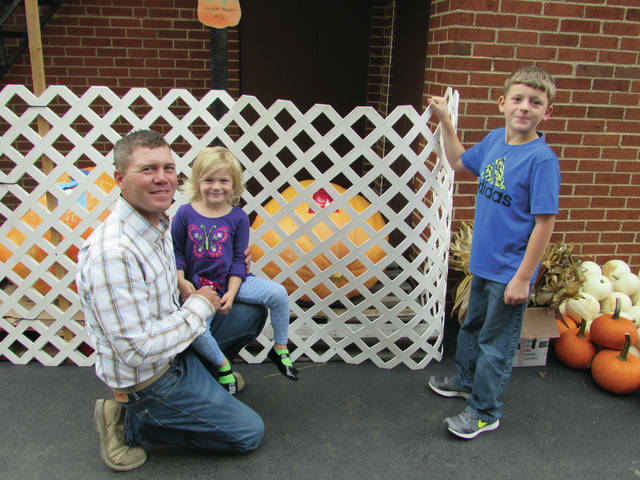 Sam Wildow | AIM Media file photo Blake Aultman of the Bradford-Greenville area poses with his children Kinley (middle) and Keegan (right) and their 336 lb. pumpkin at the 2017 Bradford Pumpkin Show. Sam Wildow | AIM Media file photo Casey Spurgeon with his son Lincoln the Pumpkin Diaper Derby at the 2017 Bradford Pumpkin Show. 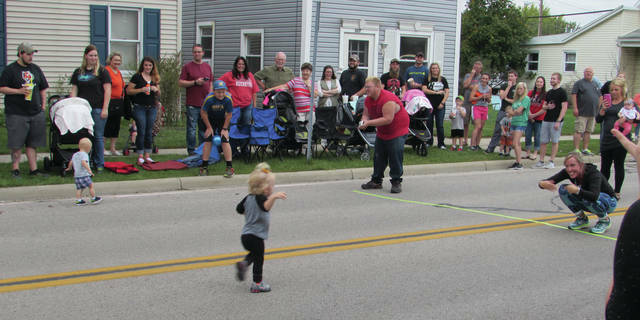 Sam Wildow | AIM Media file photo Sunny Peeples of Bradford runs toward her mother, Holly, during the Pumpkin City Run during the 2017 Bradford Pumpkin Show. BRADFORD — The annual Bradford Pumpkin Show begins this week, bringing with it confetti, parades, the popular Miss Pumpkin Queen contest, festival food, and more. The Bradford Pumpkin Show is also celebrating a big anniversary this year. “This is our 90th year,” Jim Wysong, president of the board of the Bradford Pumpkin Show, said. When asked what has kept the festival returning year after year for nine decades, Wysong said it was simply the tradition of having it. “It’s been around for a long time. The locals like the festival,” Wysong said. Wysong encouraged everyone to come out to the Bradford Pumpkin Show and have fun in the confetti. The Bradford Pumpkin Show begins Tuesday, with the midway open from 4-10 p.m. The Pumpkin Diaper Derby and Pumpkin City Run will be held at 5:30 p.m. at the north end stage. The parade will be at 7 p.m., and the Prince and Princess Contest will immediately follow the parade on the north end stage. The midway will be open from 4-10 p.m. on Wednesday with rides. The Little Miss and Master Pumpkin Contest will be held at 4:30 p.m. at the north end stage. The parade will be held at 7 p.m. with the Miss Pumpkin Queen Contest being held immediately following the parade on the north end stage. There will be no confetti on Wednesday evening. On Thursday, the midway will open from 4-10 p.m. again with rides also opening at 4 p.m. The Kiddle Tractor Pull will be held at 4:30 p.m. in the midway near the secretary’s office. The parade will be held at 7 p.m. again with the cheerleading competition being held immediately after the parade on the north end stage. On Friday, the midway is open from 1-11 p.m. The school parade will be held at 1:30 p.m. The Big Wheel Contest will be held at 4:30 p.m. in the midway near the secretary’s office. Spittin’ Image will perform on the north end stage at 8 p.m.
On Saturday, the midway will be open from 10 a.m. to 11 p.m. At 8 a.m., there will be a 5K race (Sponsored by BORM) around Bradford. From 9 a.m. to 3 p.m., there will be car show held behind the rides at the back of the village park. A craft show will open at noon at the south end of the midway. Also at noon, there will be a Pet and Novelty Parade, beginning at the city building and ending at the north end stage. 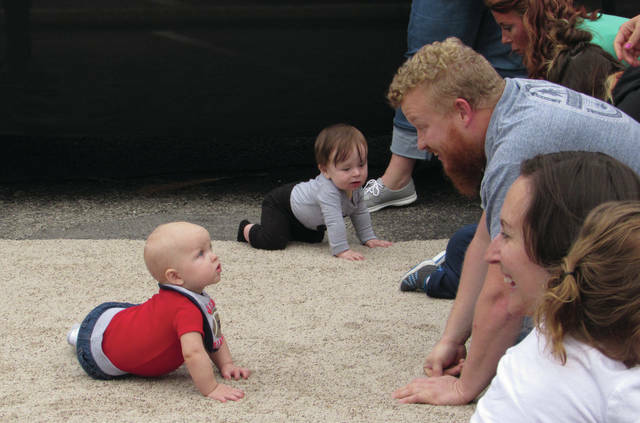 The Cutest Baby Contest will be held at 2 p.m. on the north end stage. Judging and line up begins at 1:30 p.m. The Extravaganza Parade will be held at 4 p.m. Also at the north end stage, Smash-A-Pumpkin will be held at 5 p.m. and the Lucky Pumpkin Sweepstages will be held at 10 p.m. Tickets for those two events will be on sale all week. A variety of festival food will be offered throughout the Bradford Pumpkin Show, including tenderloins, elephant ears, barbecue food, pizza, chicken, and more. “Just a little bit of everything,” Wysong said. For more information or to view maps of the event, visit BradfordPumpkinShow.org. The Bradford Pumpkin Show’s 2018 sponsors include Backyard Team Apparel, Greenville National Bank, Gregory Peck Sound Service, Joe Thoma Jewelers, Meijer, Mr. Sew and Sew’s, Littman-Thomas Agency, Treasures on High Concrete Statuary, and more. https://www.dailycall.com/wp-content/uploads/sites/30/2018/10/web1_Aultman-family-CMYK.jpgSam Wildow | AIM Media file photo Blake Aultman of the Bradford-Greenville area poses with his children Kinley (middle) and Keegan (right) and their 336 lb. pumpkin at the 2017 Bradford Pumpkin Show. https://www.dailycall.com/wp-content/uploads/sites/30/2018/10/web1_Diaper-derby-2-cmyk.jpgSam Wildow | AIM Media file photo Casey Spurgeon with his son Lincoln the Pumpkin Diaper Derby at the 2017 Bradford Pumpkin Show. https://www.dailycall.com/wp-content/uploads/sites/30/2018/10/web1_Pumpkin-city-run-CMYK-2.jpgSam Wildow | AIM Media file photo Sunny Peeples of Bradford runs toward her mother, Holly, during the Pumpkin City Run during the 2017 Bradford Pumpkin Show.